Ludhiana, September 22, 2018 (Team Online News India): The residents of the illustrious industrial town of Ludhiana have found a brand new reason to pursue healthy lifestyles. O P Munjal Rakh Bagh park inaugurated an all-new organic farmers market whose center of attraction was the ‘Earth Store’, where completely natural, unadulterated fruits, vegetables and other produce can be bought and sold by both consumers and retailers. The opening of the store took place at College Gate, Rakh Bagh, Ludhiana and was attended by Shri S K Rai, Vice Chairman of Hero Cycles, Principal Director of Income Tax (Investigation) Punjab and J & K Parneet S. Sachdeva, FICO chief Gurmeet Singh Kular, counselor Narinder Sharma Kala, MD of Dilbeer Foundation Gunbir Singh along with other well-known luminaries of the State. 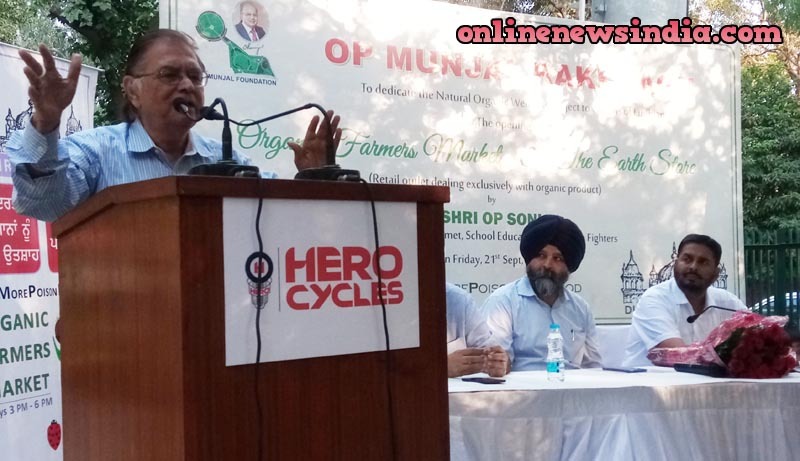 “This town and the Rakh Bagh venue, itself, is iconic for Hero Cycles because of the intertwining of its history with that of Hero’s late founder, Shri O P Munjal, whose industry, perseverance and strength of character laid the foundation of the world’s largest cycle manufacturing company today.”, said Shri S K Rai, Vice Chairman of Hero Cycles. After taking over Rakh Bagh Park, OP Munjal foundation has invested crores for the upkeep and development of OP Munjal Rakh Bag, which is spread over an area of 13.4 acres. The company has also earned considerable goodwill among local residents by starting operations of toy trains and open gym space at the part. A new cycling track, inter-locking tiles, new swings for the playground and a cafeteria, already adorn this venue, having been made during Hero’s earlier initiative to develop a health-conscious and globalized eco-friendly atmosphere and look in one of India’s most famous industrial townships.